The Academy Awards and the Grammys can’t generate the kind of excitement of ESPN’s celebration of the sporting world. Right? Regardless of how you feel about the network, you might be interested in four of the nominations for the ESPY awards. The awards ceremony is July 14. With time to kill and rain on the field, leave it up to peanut and hot dog costumes to entertain those waiting out the weather delay at the Alabama Softball Complex. Check out the video of the race, but I stand behind my alma mater Western Kentucky as the champions of rain delay fun. 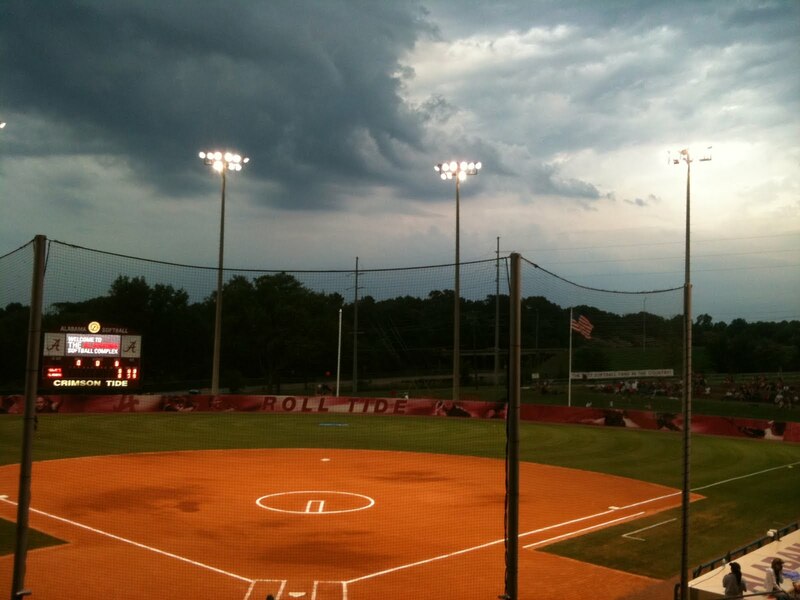 Here we are, watching the lightning at the Alabama Softball Complex as the delay enters its second hour. Alabama was supposed to open the best-of-three NCAA super regional with Hawaii. The seats are packed but the lightning isn’t stopping. The Crimson Tide baseball team is fighting for a spot in the SEC tournament. As one of a four-team deadlock for that eighth spot, Alabama needs to sweep Tennessee this weekend to have a shot. LSU and Kentucky also need to lose at least one game this weekend to keep the Tide in contention. Two Alabama wins coupled with two losses apiece from LSU and Kentucky also gets Mitch Gaspard’s team to Hoover. On the softball field, the No. 1 overall-seeded Tide hosts UAB, Lipscomb and Alcorn State in the Tuscaloosa Regional. Riding high after winning the SEC tournament a week ago, coach Patrick Murphy’s squad is pointed towards the young program’s first national title. Speaking of NCAA championships, the Alabama women’s golf team is in the hunt. The Tide is second in the championship, trailing USC by seven strokes after the second round in Wilmington, N.C. Stay tuned for updates. The men’s golf team is seeded fifth in the New Haven Regional that starts Thursday. It won the regional round a year ago with the core of that team back. It’s been a while since I trolled the internet for videos of interest. So, here you go. Just a few Alabama videos to get you to lunch. A look at the Alabama softball season. And finally, the Alabama dance team performs at a recent basketball game. Now that the holiday weekend is history, here are a few tidbits from the universe surrounding Alabama athletics. Tide baseball right fielder Kent Matthes was names a semifinalist for the coveted Golden Spikes award (the Heisman Trophy for college baseball). The unanimous SEC player of the year hit .365 with a 28 home runs and 81 RBI. He led the SEC in home runs, RBI, total bases (174) and slugging percentage (.883). He was also third in runs scored (65) and sixth in hitting this season. Speaking of baseball, every game from the Clemson Regional in which the Tide is participating, will be televised live on CSS. Decatur High graduate and former Tide basketball player Rico Pickett will have a new teammate at Manhattan College who is making news. Click here for a story about Kevin Laue who hoops with just one hand. Check out this story about Alabama softball pitcher Kelsi Dunne. Still no news on the textbook scandal ruling from the NCAA although a decision could come any day now. Stay tuned. The Crimson Tide softball team destroyed Jacksonville State in a second-straight no-hitter to claim a super-regional title. 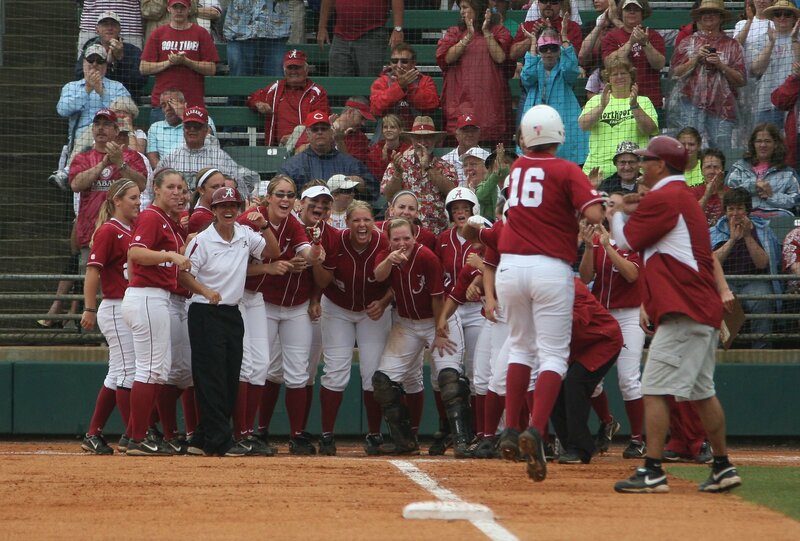 The big photo (provided by the university) may have given away the good news for Alabama softball fans. Kelsi Dunne owns the arm that threw the second-straight no-hitter for the Tide who moves on to Oklahoma City for the Women’s College World Series. Read more in Sunday’s Daily. The Alabama football team won’t need to worry about Kentucky’s Jeremy Jarmon when it plays in Lexington this fall. The senior defensive end tested positive for a banned substance and will lose his remaining year of eligibility. (Read the full story here). Jarmon made three solo tackles in last season’s Alabama win over the Wildcats. Jim Wells and the Tide baseball program has just fewer than two more days before the NCAA baseball bracket is released. Stay tuned for more on that. Also in the stay tuned category, the Alabama textbook scandal ruling could be coming any day now. Logical thinking says it will at least wait until after the weekend. An Alabama official said they should be prepared for it to be released at any time. As I said, stay tuned. Tennessee football is hiring for a new strength coach. Read more here. As an avid Yankee fan, these are strange times with that new park replacing my Stadium. But now college football wants a piece of the new ballyard. Notre Dame would like to occupy one Saturday when the Bombers are away, according to this New York Times story. Why not? That city needs to milk every cent out of that place before it decides to build another new one. If you have any news or opinions to pass along, please don’t hesitate to post it in the comment section below. Have a nice weekend, but don’t be a stranger to the blog.